Percy Bysshe Shelley (4 August 1792 – 8 July 1822) was an English poet of the early nineteenth century. He is widely thought of as one of most important poets of the Romantic movement in English literature. Some of his poems, like Ozymandias and Ode to the West Wind, are among the most famous in English. Shelley was born in Horsham, Sussex. He was the son of a member of Parliament. He attended the University of Oxford, for only one year; he was expelled for being an atheist. In his own time Shelley was very unpopular for his political and religious views and for his personal conduct. He married young, but left his wife to run away with Mary Godwin. After Shelley's first wife committed suicide, Shelley married Mary Godwin; she later became famous as Mary Shelley, the author of the novel Frankenstein. Shelley left England and spent much of his life travelling in Europe, especially in Italy. He became a close friend of poet Lord Byron, who also left England and travelled in Europe because of sexual controversy at home. 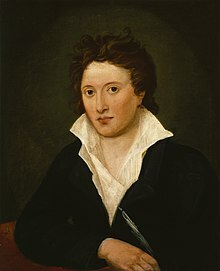 Shelley continued to write poetry throughout this time; he wrote several major works, like the verse drama The Cenci and long poems like Alastor and Adonais, as well as many shorter poems. About a month before his 30th birthday, Shelley drowned in a boating accident off the coast of Italy. He was one of three important English Romantic poets of the same generation who died young; the other two were Lord Byron and John Keats. This page was last changed on 15 December 2017, at 20:11.